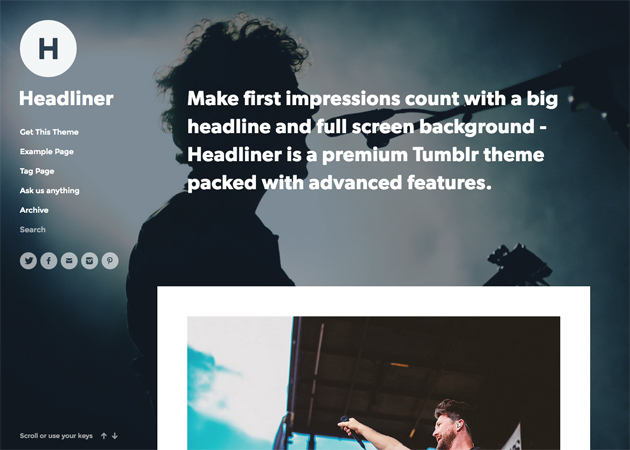 Make your Tumblr blog look amazing. 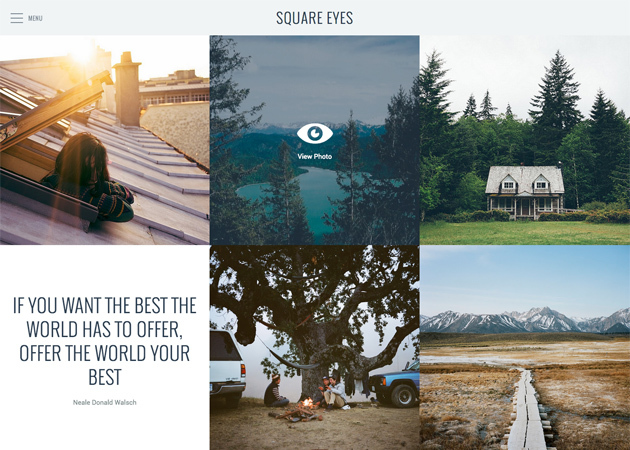 Make a huge impact with this super-size, parallaxing responsive grid theme. 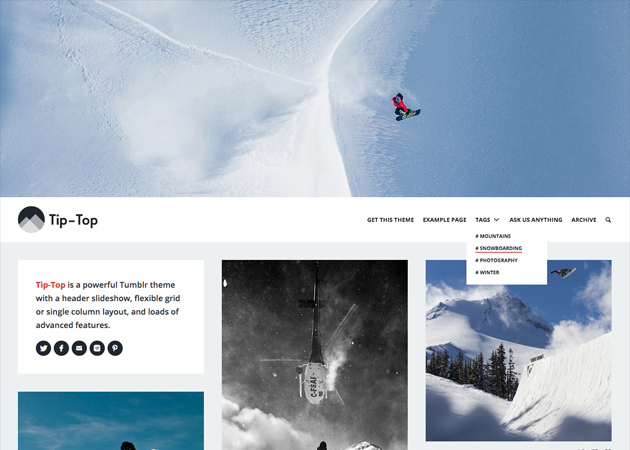 Tell your story with a stylist header slideshow, fixed sidebar navigation and large immersive posts. 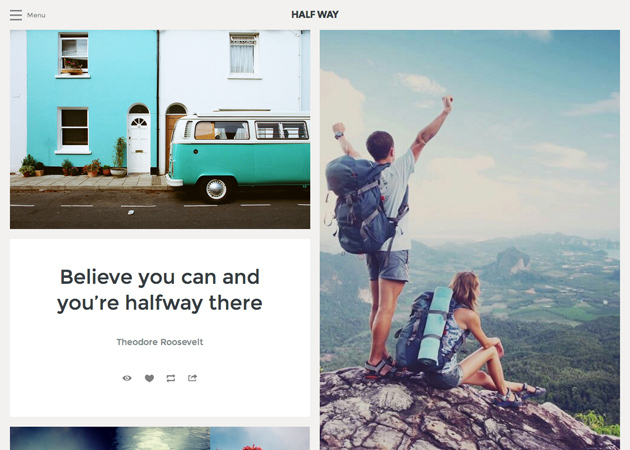 Our Tumblr themes make it easy to create a blog that looks amazing. Whether you're a creative or business using Tumblr to show off your work, expressing yourself by curating your favorite things, or keeping loved ones updated on your life's adventures, we've got the best themes to help you get it out there. 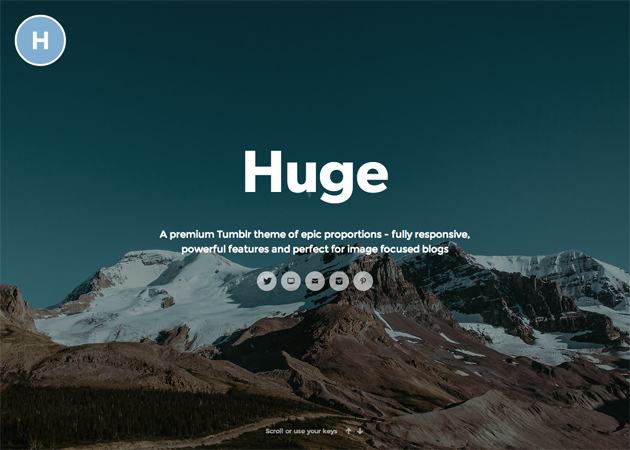 A premium theme of epic proportions, perfect for image focused blogs. An optional typed intro, flexible grid layout and tons of powerful features. 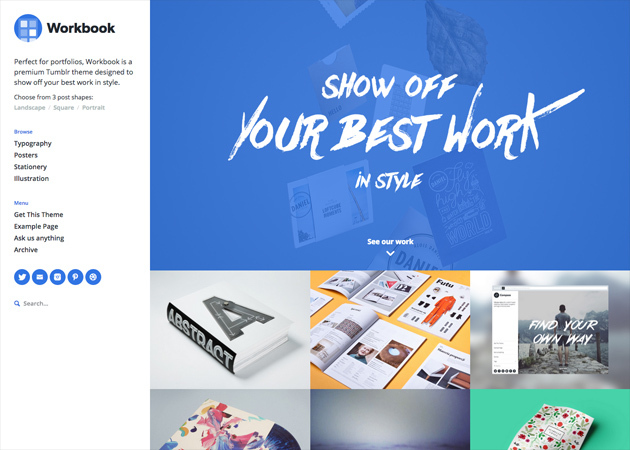 Perfect for portfolios, Workbook is designed to show off your best work in style. All of our themes come with a set of powerful premium features to help you get the most out of your blog. We keep them running perfectly with regular updates, tweaks and new features. We’re always thinking about new ways to make things even better. 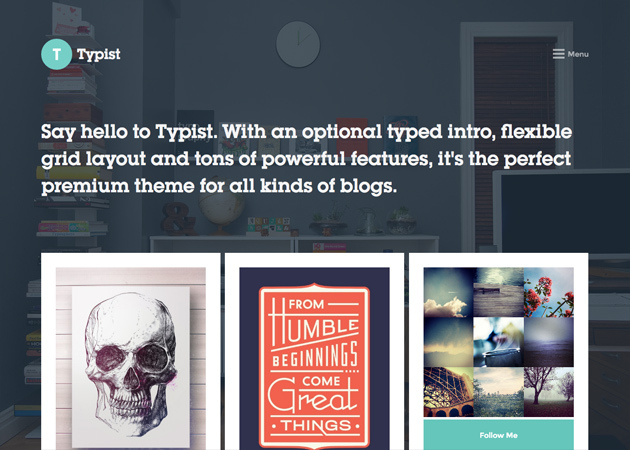 A theme for all kinds of blogs, with a great header slideshow and loads of advanced features. Perfect for minimalists – all the features you need and nothing more, presented beautifully. Make first impressions count with a big headline and full screen background. 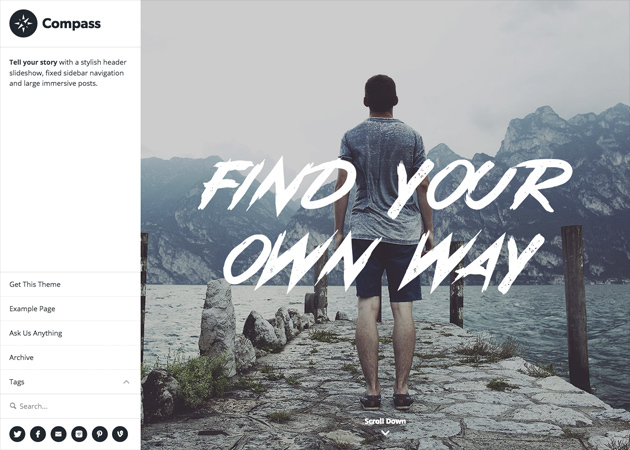 Our Tumblr themes are designed for you to make them your own and show off your individual style. You can customize almost everything you see via the built in options, with no coding necessary. Can’t figure something out? Just ask us! 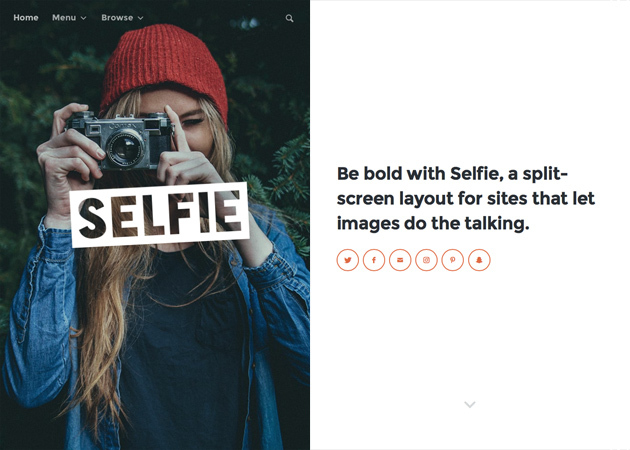 A full-screen square grid with awesome hover interactions to show off your masterpieces. 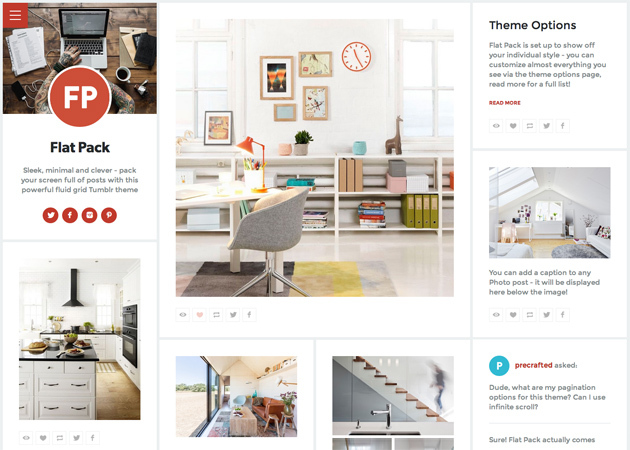 Perfect for curators and highly visual blogs, this two-column theme puts the focus on your content. 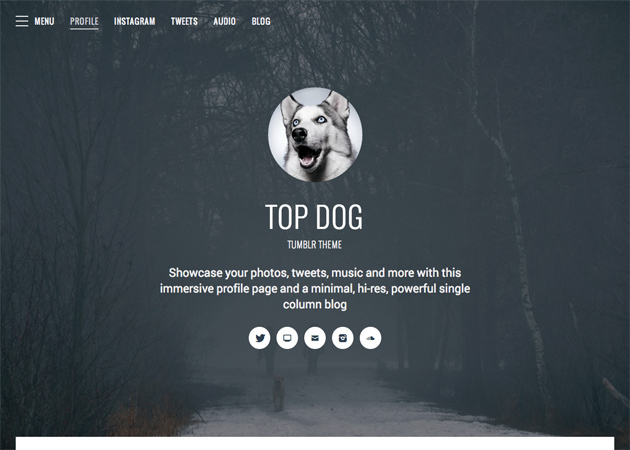 Showcase your photos, tweets, music and more with this immersive profile page and blog. 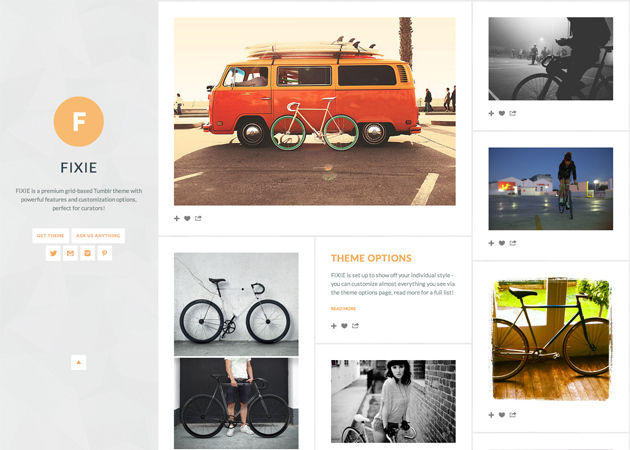 Sleek, minimal and clever – pack your screen full of posts with this powerful fluid grid theme. 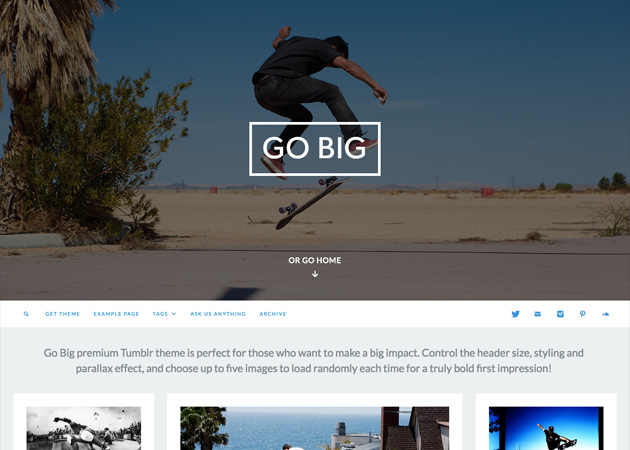 Our themes power the sites of over 100,000 creatives and brands on Tumblr. Tons of well-known brands like Nike, Amazon, Star Wars, Fox, Jeep, Blink 182, Fiat, Disney, Jawbone, Shopify, Shake Shack, Nestlé, Southern Comfort, Lyft and countless others have trusted our themes to present themselves on Tumblr. Our themes have helped thousands of independent creators to get their work out into the world. Photographers, designers, musicians, fashion bloggers, coders, illustrators, bakers, writers, travellers, entrepreneurs... it's a constant inspiration to see so many super-talented folks using our themes. This beautifully organic, randomly-positioned layout gives your blog a truly unique look and feel. It’s a premium theme. For free. All of the same features, none of the same cost. 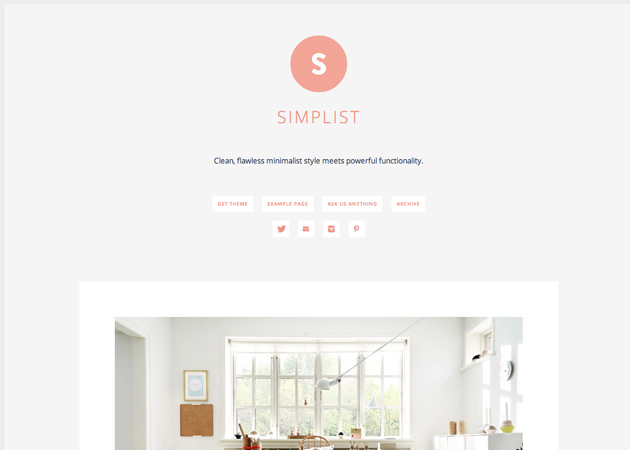 Get our themes directly from Tumblr. 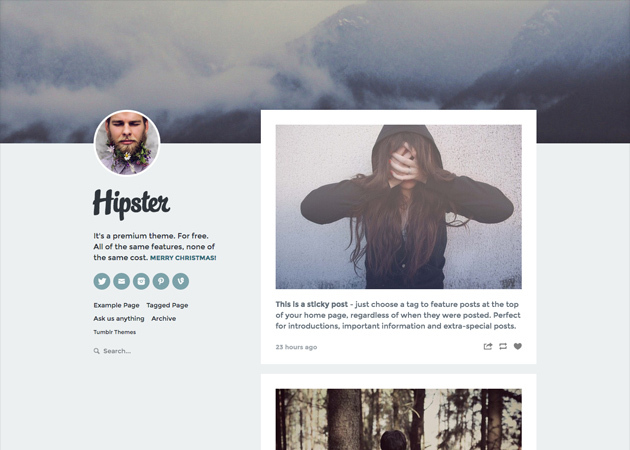 We make loads of top-quality Tumblr themes, for all kinds of sites. They're available directly from Tumblr, with no coding necessary - check out the full range here.